The house is the perfect Caribbean villa vacation � located just 20 minutes from the airport and 15 minutes from St Georges town centre, within easy reach of both the south and east coast beaches of the island. The location offers privacy and seclusion. 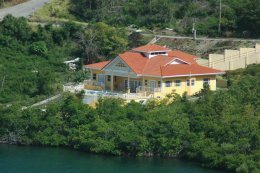 The property was completed in 2005, built in a tranquil location on the exclusive Egmont Development, It is right on the waterfront giving direct access to the bay for swimming and fishing. As you enter the house, the first thing that strikes you is the wonderful view directly through the large patio doors which open out onto the patio, the pool and the sea beyond. Every room is beautifully furnished in Caribbean style, and tropical prints and pictures complete the d�cor as you will see from the photos below ( click on an image to enlarge). Accommodation is bright and airy with an open plan living area so that you can enjoy the views from every room. The lawn slopes down to the bay and private dock where the yacht is moored. There are three large bedrooms - two doubles at the back with patio doors leading on to their own balcony area overlooking the sea, and a double room at the front of the house. There are three bathrooms, two of which are en-suite with the third being for general use and for the third bedroom. All bedrooms have air conidtioning, ceiling fans and mosquito netting at all windows. The main living area is split level, with a spacious and well equipped kitchen and large dining area on the upper level, and a large living area on the lower level. Above all this is a vast, high ceiling with an unusual skylight feature. Fans and louvred windows keep the whole house very cool. Outside, the covered patio provides a shaded dining area, and is the perfect place to eat, drink and relax in the chairs or hammock. This leads directly on to the pool and pool deck, with steps down to a further lower level onto a tiled and mosaiqued lower dexk area. There is a pretty pagoda style seating area by the pool.